Uniform Civil Code is an extremely dangerous Damoclean Sword, which is hanging before the necks of the members of the Muslim minority community in India and it has been hanging since the day an accursed Article was passed in the Constituent Assembly on the 23rd November 1948. This clause was initially introduced in the Assembly as Art.35 in the original draft. This Amendment was seconded by Janab Naziruddin Ahmed Saheb of West Bengal, who said that it is NOT Muslims alone who possess personal laws and that each community has certain religious laws, certain civil laws inseparable with inseparable religious beliefs and practices. The communities who have their Personal Laws will also be affected, he said. The Amendment was endorsed by Janab Mahboob Ali Baig Saheb of Bezwada, who asserted that as far as Muslims are concerned; their laws of succession, inheritance, marriage and divorce are completely dependent on their religion. Shri Ananthasynam Iyengar of Chittoor [ who later on became the Speaker of the Lok Sabha] interrupted him saying that marriages in Islam are mere civil contracts and religious affairs. To this, Baig Saheb gave a fitting reply that a Muslim marriage, without any doubt a “civil contract” but it must be noted that such a “civil contract” is enjoined on Muslims by the Quran and if it is not followed, such a marriage is not classified as valid marriage at all in Islam. The Amendment was further seconded by Janab B.Pocker Saheb of Kerala who referred to some of the important questions raised by some Hindu Members pertaining to that Article and opposed it tooth and nail. Janab Hussain Imam Saheb of Bihar too eloquently supported the amendment moved by the leader of the Indian Union Muslim League. But so determined the Congress Party Members to see that the Article is passed that they did not even allow the Muslim League members to explain the reasons why they were opposing the proposal. 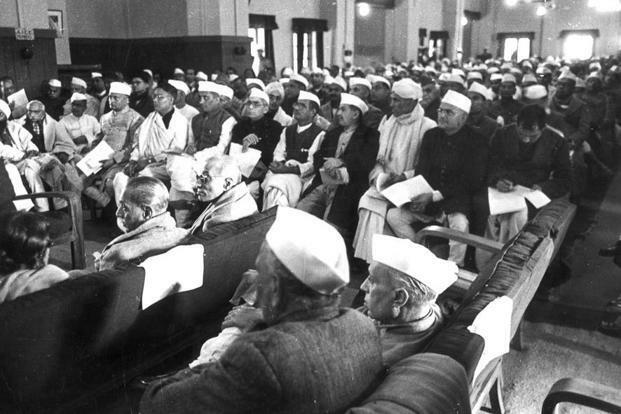 Muslim Congressmen – including Maulana Azad –kept silent during the debate fearing that if they opened their mouth they will be sacked and disgraced. Alas! The house was gutted by its own house lamp. Baba Saheb Ambedkar gave a solemn assurance that the Government will see that the rights of the minorities will not be trampled upon. They took his assurance to be Gospel truth and having no other alternative except to formally vote against when it was put to vote, they voted against it, those who were in favor of the Article won because they were in the majority in the House. This Article, which was in deep slumber like Rip Van Winkle in the fairy tale, has been awakened by the BJP Government of India. It has thus sowed the seeds of distrust and dissatisfaction against it in the minds of the members of the minority communities, who will teach it a bitter lesson when elections are held. It is the fond and fervent hope of the author of this write-up that better counsel will prevail and the BJP Government of India will refrain from committing political suicide.